Keloid scars are heap-up scars which are developed with injuries causing due to, acne, burns, ear piercing, chickenpox, surgical cuts, scratches and vaccination sites and build up abruptly on the skin surface. Keloid scars develop commonly in people between age group 10 to 20 years of age. Globally, development of advance technology based treatment, rise in the appearance consciousness, and increasing awareness about scare treatment products, and expenditure on personal care, and changing lifestyle are the prime growth drivers of global keloid treatment market. 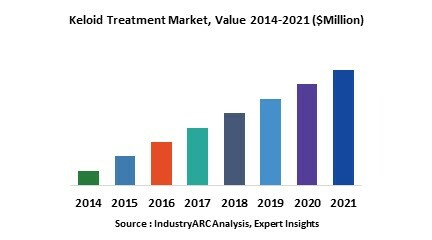 In addition, increase in adoption of of radiation therapy, surgical intervention, and steroid injections and, emerging economies such as China, India and others, will create new opportunities for global keloid treatment market. However, higher cost of treatment, and risk of side effects and complications during treatment are the key restraints for global keloid treatment market. This report identifies the global keloid treatment market size in for the year 2014-2016, and forecast of the same for year 2021. It also highlights the potential growth opportunities in the coming years, while also reviewing the market drivers, restraints, growth indicators, challenges, market dynamics, competitive landscape, and other key aspects with respect to global keloid treatment market. Geographically North America dominated global keloid treatment market, and Asia Pacific is projected to have fastest growth, owing to rapidly increasing aging population, growing disposable income, rising focus on personal well-being and modernizing healthcare infrastructure in this region. Among all the treatments, surgical treatment segment has the highest market share in global keloid treatment market. 14.3. Valeant Pharmaceuticals International Inc.